I'll be honest with you. 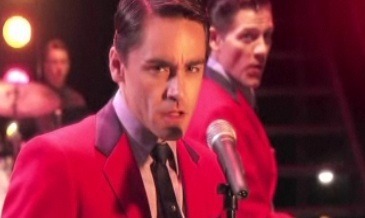 Before I went to see Jersey Boys I only vaguely knew who Frankie Valli was, and that was because my Dad used to sing 'Big Girls Don't Cry' to me when I was very little, and crying, and that was the second number one hit for Frankie Valli and The Four Seasons. But it turns out that my subconscious knows loads of Four Seasons songs: 'Sherry', 'Walk Like A Man', 'My Eyes Adored You', 'Workin' My Way Back to You' and 'Beggin' are the ones that now spring to mind first – all that street corner pop that's so good for long car trip sing-a-longs. So it's 2008 and my friend wins a set of tickets to this new musical opening in London and we think, "Ok, why not? If we don't like it and there are too many Mums in the audience throwing their knickers and squealing like teenagers then we can always leave." But of course we stayed until the end – even for the band's playout, which is a medley of all the hits from the show - that the audience starts singing and dancing along with. That's how feel good it was. We stayed even while the audience sang loudly over the super talented, and my friend thought dashing, guys on stage. And FYI, it wouldn't be easy to play the Frankie Valli role, that guy has one of the most powerful falsetto voices in audio recorded history. 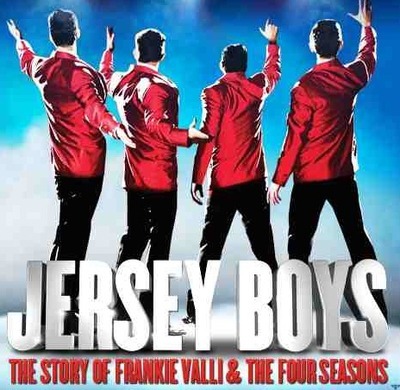 Aside from Frankie, the other three 'boys' – meaning characters - on the poster are Bob Gaudio, who's credited with writing the songs for the musical, Tommy DeVito and Nick Massi. If you know more about the band than I did then you'll know that these were pretty much the starting line up, and you'll guess that the musical follows them in their early years, before they joined up and before they hit 'the big time', though to the split of the original group. 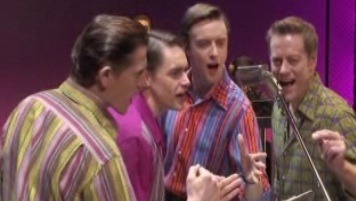 It's cleverly divided into four seasons, each told from the point of view of a different band member. One of the things that I really liked about this musical is that it's telling a real story but escapes ever being trite or too sentimental. The way the songs are written into the story will resonate with anyone who, after falling in love, or being broken up with, sat down and tried to write a song. And the pace is retained throughout. One of the other things that I think is worth mentioning is the staging, which is simple and cleverly done. The lighting is great and the costumes are great, but the songs are clearly king of this show. This is a musical for people who really love music. If you're not convinced, or you don't think you'll know any of the songs then check out the video on the website.